The hunt for the world record largemouth bass has been one of the most sought after and elusive freshwater fishing feats for over eight decades and counting. The big bad behemoth bucketmouth that George Perry caught has yet to be topped. How much longer will it take before there is a new record largemouth? Manabu Kurita may be the man to do it. He has managed to catch a monster largemouth to be credited with a tie. Click here to read more of Kurita's controversial story about his world record bass. 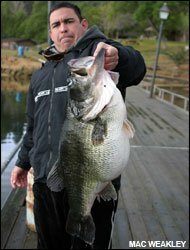 And you can check out George Perry's world record largemouth bass here. Many men and women have come very close to catching the record. And people have traveled from all over to fish waters where they predict the biggest lunkers to be lurking. Where will the next record largemouth bass come from then... Japan, California, Texas, Mexico...? It has become a passionate obsession for three men in southern California. Mac Weakley, Mike "Boodah" Winn, and Jed Dickerson have been on a relentless path to bust the largemouth bass world record. Their dedication has gained them world renowned recognition with the famous legend of the massive largemouth bass, rightfully nicknamed "Dottie." On the morning of March 20, 2006, they set out on another day at Dixon Lake for a shot at besting the largemouth bass world record. Dixon Lake is a 72 acre impoundment in Escondido of San Diego County. It had been raining in the darker part of the morning. There were overcast skies causing it to be a bit gloomy, so they didn't think they would have much of a chance. However, they located her on a spawning bed in about 12 feet of water with a big male. Mac Weakley tossed out a white jig with a skirt and rattle. One of the fish made a few stabs at the lure, but they couldn't tell for sure which one. At around 6:40 AM, Weakley set the hook on one of the fish. After about 5 minutes of fight and a bit of a mishap, they finally landed the giant largemouth. A whopping 25 pounds and 1 ounce! They obviously took pictures and recorded some video as well. But wait! 25 lbs, 1 oz?... Didn't George Perry's world record largemouth bass weigh in at 22 ¼ pounds? Yeah, it sure did. So why isn't it an official largemouth bass world record? Because the fish was fouled hooked in her side. And against Winn and Dickerson's wishes, Weakley decided not to pursue it. However, as they had later learned, the IGFA states that a fish shall not be intentionally foul hooked. To clarify, a fish must voluntarily take the lure into it's mouth to be a legal catch. Regardless, he still chose not to challenge it. Could you imagine all of the controversy that would bring? On the Friday of May 9, 2006, a massive largemouth bass was found floating the water's surface of the lake. Jed Dickerson had just recently left the compound, exhausted from another routine outing. The park ranger called him around 11:45 a.m. and let him know that he ought to come back to the lake. Sure enough, it was her. He confirmed it was Dottie. She had passed away on Mother's Day weekend before spawning out one last time. Even so, she still weighed about 19 pounds. Their quest for world record status began in the late 90's. 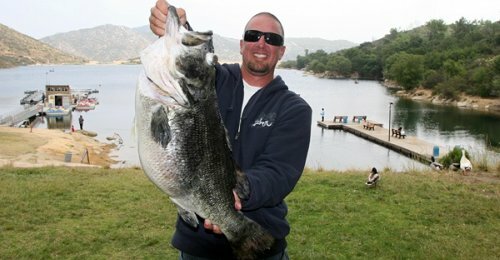 They had heard of rumors of a world record caliber largemouth bass lurking around Dixon Lake. 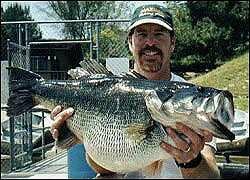 In 2003, Dickerson plucked the enormous largemouth off of a spawning bed. They weighed her immediately at around an astounding 23 pounds. That should of classified as the new record largemouth bass. However, it took Fish and Game about 3 hours to finally show up. By that time, she had stressed and lost weight, dropping down to 21 lbs, 11 oz. 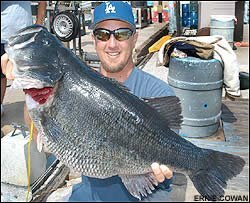 That is still the 4th largest black bass ever recorded. This is when they first noticed the significant black beauty mark under her right gill plate. She was then deemed as the legendary Dottie. Also, on April 21, 2001, Mike Long, a well acclaimed big bass angler, caught a 20 lb, 12 oz. largemouth at Dixon Lake using a swimbait, which ranks at number 9 of all record largemouth bass. It's believed that the fish he caught was Dottie as well. And, Mike Long is no stranger to busting some of the biggest bass around. and their quest for landing the "One."